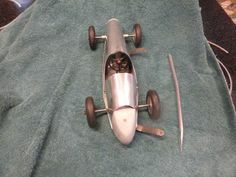 A list of various vintage-model related websites that may be of interest. Vintage Model Yacht Group – I can thoroughly recommend the VMYG website, should you wish to join then the cost of membership is very reasonable and you’ll receive quarterly copies of their excellent publication “The Turning Pole”. Pond Yacht Antiques – A fabulous selection of interesting original pond yachts and nautical prints. On The Wire – A fantastic website that’s updated monthly and is dedicated to the gathering and recording of information relating to tethered cars, tethered hydroplanes and the engines that powered them. CJB Boatyard – A superb website dedicated to the products of Sutcliffe Pressings Limited and in particular the toy boats that they produced from 1920 right through until 1984, when the factory finally closed its doors. Sutcliffe Boats – A brilliant website that gives an insight into the products of Sutcliffe Pressings Limited – detailing the history of the company and the family behind it. 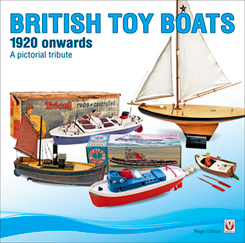 British Toy Boats – A fabulous book that comprehensively details the products of all the major British manufacturers such as Bowman, Skipper, Star, Sutcliffe and Triang, to name but a few, as well as those offered by the smaller, lesser known companies. The book contains many previously unpublished images and will be of particular interest to collectors as, towards the back, it carries an extensive catalogue of products together with detailed descriptions and production dates. Further details are available by clicking on the image.